↑ Baddeley, Alan (2012-01-10). «Working Memory: Theories, Models, and Controversies». Annual Review of Psychology (en inglés) 63 (1): 1-29. ISSN 0066-4308. doi:10.1146/annurev-psych-120710-100422. Consultado el 2019-03-06. ↑ Baddeley, A (1992-01-31). «Working memory». Science (en inglés) 255 (5044): 556-559. ISSN 0036-8075. doi:10.1126/science.1736359. Consultado el 2019-03-06. ↑ Baddeley, Alan (2000-11). 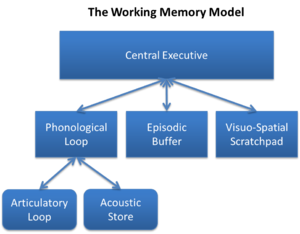 «The episodic buffer: a new component of working memory?». Trends in Cognitive Sciences (en inglés) 4 (11): 417-423. doi:10.1016/S1364-6613(00)01538-2. Consultado el 2019-03-06. Esta página se editó por última vez el 10 mar 2019 a las 12:11.